Business Magnate and... President of the United States! After a brilliant business and TV celebrity career, Donald Trump is now the 45th president of the United States of America. I wrote this article a few years ago, but its content is still very current. Trump's extravagant lifestyle and outspoken manner have made him a celebrity for years... and the head of a big nation now. 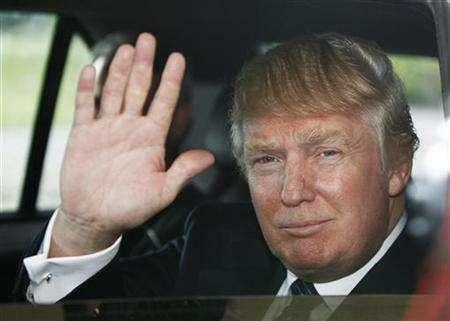 When I look at Donald Trump's hand, the first thing I see is how wide and fleshy his palm is. It shows he is a man of action. He has an incredible amount of energy and nothing can stop him. He is also something like a steam roller, as indicated by the center of his palm, which is as high as the rest of his hand (normally, the center of the hand is a bit hollow). This can be expected from a man who enjoyed saying "You're fired!" on television and who always expresses himself very bluntly. His very flexible thumb shows he is very adaptable and has a flexible mind. Donald Trump can adapt to situations and turn things around quickly. His short fingers allow him to think and act fast. His index finger and ring finger are the same length, signifying an excellent balance between his sense of self and role in society, and his ability to shine and share. A balanced man. However, Donald Trump's middle finger is bent toward the ring finger at the level of the first knuckle. As he was growing up, he may have had conflicting messages from his parents (such as "you can play with water but don't get wet"), which may have created conflicting emotions. Sometimes, as an adult, the person may be ruthless in making decisions. This seems to have happened in this case. The shape of the baby finger tells a different story: it shows some sort of emotional abandonment in childhood, which led him to become overly assertive later on, in order to compensate for his feelings. 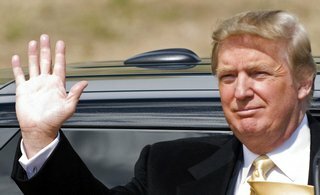 Donald Trump's heart line (the top horizontal line of the three main lines) originates right between the index finger and the middle finger. It shows a quiet, analytical nature. He tends to view life in subjective terms, sometimes unable to put himself in someone else's shoes. Finally, the mount of Venus (ball of the thumb) is very developed, showing enjoyment for a good life and senses pleasures. For the rest, let's wait and see!